We're picking up with our coverage of Ignition with the European and American offerings. Our original plan was to do a single post for the whole show but there was such an overwhelming number of Japanese cars that we had to have a separate post just for them. It's awesome to be able to see cars from all parts of the car community at one show. We're planning to have some additional correspondents added to the blog that give these more niche corners of the car community their due justice. But, without further adieu, here is the Americans and Europeans of Ignition 2017. Despite two other Volkswagen/Audi events happening the same day, there was still a solid showing from their community. This goes to show the strength of the VAG community in Minnesota. 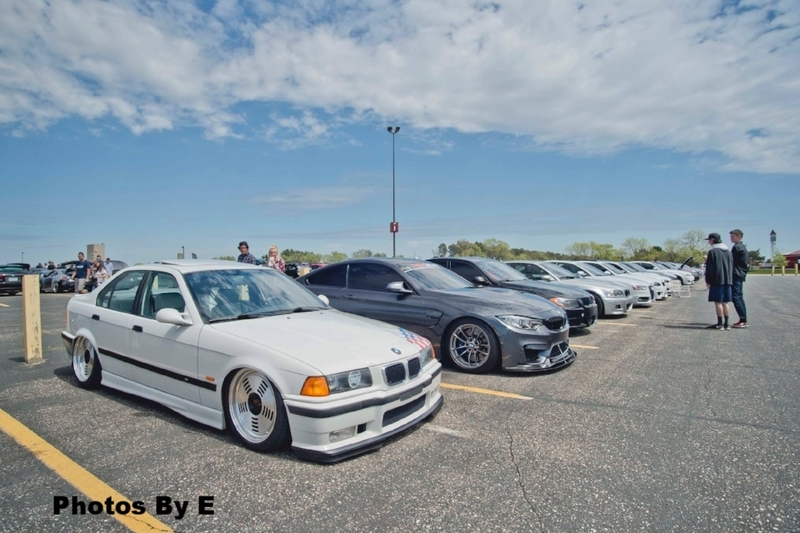 Along with MSRA's Back to the 50s, the Eurowerks show has been consistently one of the must see shows in the state and it absolutely has improved the quality of the European builds we have in the state. One car from the VAG area that stood out especially for me was this Mk.1 Cabriolet. The cleanliness of execution, overfenders and the super-rare era-correct BBS lip kit really pulled it all together. Unfortunately by the time we came about for judging I wasn't able to find it. Under the hood resides a 2.0L swap, the owners goal for this car is to have the ultimate Cabrio driver and this does a great job of fulfilling that role. Although the VAG camp is by far the most prolific of the German car communities in the state, our BMW community is fairly large as well. They had a little of everything in show from a square tail 2002 to a new M4. Despite the higher entry cost relative to VWs or most other cars at the show, they had a fantastic level of detail put into their builds across the board. This E36 on Rotiform BM1s caught my eye, the E36 is just boxy enough to pull those wheels off. Rotiform has been killing it with their new designs, the throwback to the original BMW M1 wheel that Rotiform did with the BM1 is one of the best modern retro wheels around. If you're wondering what's going on with the vinyl on the hood, it's a homage to the E36 M3 Lightweight which was a homologation model that, in addition to some other factory modifications, was 200 lbs lighter than the standard E36. Roughly 125 were built but BMW never disclosed the total production number. Since a real Lightweight is unobtanium, clones are the next best thing. I also am digging the Hella covers on the high beams. Coming out of left field, MN Mercedes Benz had a really solid showing of cars. Mercedes doesn't have as big of a following as BMW does with enthusiasts but these are awesome platforms to build on. The new ones are all automatic but if anyone can make a decent automatic, it's Mercedes. Even the older models from prior to the 1990s were some of the most bulletproof cars ever made. Their W201 190E was our honorable mention for the Top 5 Euros of the 1980s post we did a few weeks back if there is any doubt of their performance history. Speaking of coming out of left field were a pair of Triumphs off in a corner of the show. While the red TR7 was one of the best looking wedge shaped sports cars of the 80's, the Spitfire next to it was one of the best handling roadsters of the 1970s. I wanted to get a better look at the TR7 but was distracted by what was under the hood of the blue spitfire, which sat an F20C from an S2000. The driving dynamics of the original British Roadsters inspired the Miata that we all love today, I can only imagine that with this engine the car has to be a blast to drive. Unfortunately they had some really stiff competition from the Germans for the Best Euro category and barely missed getting a trophy. Hopefully we can get more British cars out next year because cars like these should have their own category. A couple of Saabs showed up to the show, there was this very late model 9-5 and a late 80s Saab 900 SPG. The car pictured was the late model 9-5, unfortunately this car was brought to market months before Saab closed their doors. The company had been let go from GM after the recession but was bought out by the owner of Spyker, a Dutch supercar company. As great as the last generation 9-5 was, it was too little too late for the troubled car company. Luckily a handful of enthusiasts are around to keep their legacy alive. Speaking of keeping the legacy alive, MNE&S had cars on display from all eras of modern super cars from the pristine 930 turbo in the foreground to a brand new Lamborghini Aventador alongside it. Of all the cars there, the euro that got the most looks was this Ariel Atom. If you're not familiar with what an Ariel Atom is, I implore you to watch the Top Gear review of it here. In short terms, it is a tube chassis track car with a supercharged Civic Type-R K20Z4 or a few other Honda 4 cylinder options. The standard Civic Type-R sourced K-series provides a power to weight ratio of 600 HP per ton but if you do some digging there is a V8 Atom with, you guessed it, a 500 HP V8. Moving onto the American cars, a little bit of everything was in show. Everything from a kustom 50's Ford coupe to new darts could be found. This picture was a cool look at how MOPAR compacts have changed from captive import Mitsubishi Mirages in the background to the new Darts. The Dart reminds me of the Neons of the 90's and early 2000's, They were a surprisingly capable compact sedan that had a bad rap. Unfortunately, they've been discontinued so FCA can concentrate on crossovers. Maybe FCA can take a note from Subaru's book and offer a 5-door hatch instead, that's wishful thinking though. In the GM lineup it was a hodgepodge of stuff they've made over the last 30 years. Pontiac GTPs, Firebirds, Chevy Cobalt SS's and even a ex-police car Caprice. GM are masters of making interesting variants of their obscure models. For examples of interesting variants of cars, look no further than the Syclone and Typhoons of the early 90s. These were GMC Sonomas and GMC Jimmys respectively but featured a turbocharged 3.8L V6 found in a Grand National and fed through an AWD system. This made these the fastest accelerating vehicles on the road when they were in production. Ford has been making awesome performance variants of their Focus for nearly 20 years now. If you wanted to feel old, the first generation Focus is about as old as some of the drivers here. Today as we all know the top model Focus has evolved into an AWD rally homologation monster. Back to the 80's had their booth at Ignition and it looked pretty popular. We have coverage pending and it will be up in coming weeks. Given that the Fiero Club of MN was hosting the show, it goes without saying they would have an awesome matte green Fiero at their booth. Of course with American cars, you can't forget their bread and butter, the classic muscle car. It wasn't exactly Summer Nationals but a good number were in show. This GTO caught my eye, it's a great example of the quintessential muscle street car found in just about every garage in North America. This green Buick Skylark was just a few cars down as well. I'm not the biggest fan of the Pro Mod style but if I were to build a Pro Mod it would look like this. As a build, this car does a good job of just enough updating for a better driving experience without losing the original personality of the car. This late 60's Barracuda was more of my style. At first glance it's a rough older muscle car painted matte black, then looking under the car you notice that the owner has what appears to be traction bars on the rear suspension. Given that traction bars limit axle wrap, usually on high power applications, maybe there is more to this car than meets the eye. As great as the other muscle cars were, nothing can hold a candle to this Dodge Daytona. The Daytona was a homologation NASCAR for the road, featuring an aerodynamic treatment and every trick Dodge could pull. In racing form this was the first NASCAR to hit 200 MPH, needless to say this had more of a racing pedigree than 90% of the cars there. Other muscle cars ranged from rowdy to mild. The blower with a '66 Dart sticking out of it made more of a ruckus than anything else in show, and the closer to stock '69 or so Mustang was the perfect muscle car for taking on the street. While the original muscle cars were normal family cars with huge unnecessarily powerful engines stuffed under the hood, the modern muscle car makes an attempt to refine this style. I wouldn't call it a muscle car per say rather, a crude sports car and I use crude in a loving way. A purpose built chassis, suspension and brake system, like this Camaro has, makes the car capable of taking that same power and delivering it in a way that makes them a much more viable sports car but still keeps the barely contained feeling that you had with the original cars. In the last few years we have seen the diesel truck community grow exponentially and hit the mainstream. What diesel trucks offer to a car enthusiast is very close to what old muscle cars offered 40 years ago. If you're looking vehicle that was body on chassis, fairly modular and easy to build power on, it's hard to not consider diesel trucks. Add to that, a lot of the millennials with money right now buy these as work trucks, it begins to make sense why these have boomed in popularity in recent years. Of course older American trucks are also popular as well. This derelict build had all of it's shiny bits rechromed but they kept the patina on the original paint. Together it makes a really cool truck that is a work of art but still can be used for it's original purpose if needed. Also note the electric fan, I can't remember what engine it had but I do remember it wasn't the original straight-6 it would of come with. As we've mentioned before in our eulogy to Vic Edelbrock Jr. the first step to tuning an American car from the late 70s was to overcome Emissions. Once this was done, most cars were just as capable as any other V8 car. This Mustang II hatchback is a great example of taking a largely dismissed Malaise-era chassis and making it much more capable. Among the first muscle cars to overcome the woes of The Malaise was the Foxbody Mustang. While the previous generation we spoke about above was crippled by it's emissions equipment and based off a Ford Pinto platform, the Foxbody evolved to use modern technology to make itself one of the most capable cars of the 1980s. The 1979 through 1985 models used carburetors and easily removable emissions equipment but in 1986 Ford released a fuel injected version which was both powerful and user friendly for people who were looking to build power. To date the Fox Body Mustang is one of the cheapest cars to make fast. Modern Mustangs owe their existence to the Foxbody, had that car not been as successful as it was Ford could very easily have gone through with their plan to make the next generation of Mustang based off the Probe. Today the Mustang enjoys being among the most capable American cars on the road. Of course that's implying they're not owned by some yobbo who can't control it's independant rear suspension. You got motorcycle on my car. You got car on my motorcycle. Together, they are actually kind of cool. The Polaris Slingshot guys were aplenty. I've never driven one but I imagine it's a riot to drive. For actual motorcycles, the area had a decent amount of cool bikes. The standout for me was this baby blue dresser style Harley. The pinstriping was really well executed. The modern MOPAR section was rather diverse ranging from a supercharged Magnum SRT-8 wagon to a purple Challenger donk. One thing that Chrysler doesn't lack is diversity in their color palate, other manufacturers could take a note from that, *cough* mazda *cough*. The Modern Automotive Performance booth had an awesome setup of cars featuring parts they either make or sell. I like how the cars were set up to gradually morph from as Japanese as possible with the R32 GT-R to as 'murican as possible with the turbocharged Silverado. Overall for our first Ignition show, we did pretty well. 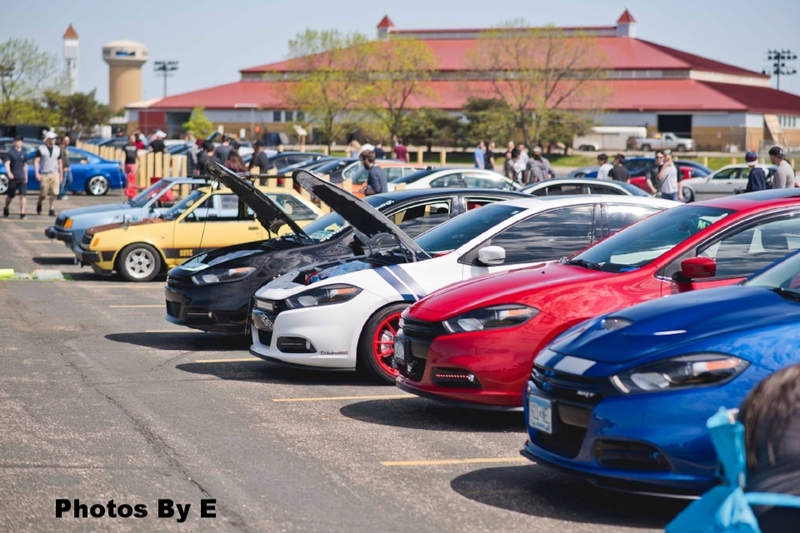 Hundreds of people showed up, people had a great time and great examples of cars from all areas of the car community showed up. I would call it a successful show and next year will be even bigger and better.